Three Chimneys Farm’s Carina Mia jumped to the lead from the start andturned back a challenge from previously unbeaten favorite Stageplay in mid-stretch and drew away on a sloppy track to a front-running 4 ¼-length victory under Julien Leparoux in Saturday’s 72nd running of the $200,000-guaranteed Golden Rod Stakes (Grade II)for juvenile fillies on Churchill Downs’ “Stars of Tomorrow II” program devoted exclusively to races for 2-year-old Thoroughbreds. Carina Mia’s victory for Hall of Fame trainer and all-time Churchill Downs win leader Bill Mott came in her stakes debut and was her second in three career races. The Golden Rod win enabled the 2-year-old daughter of Malibu Moon to score her first points on the “Road to the Kentucky Oaks” series of races that will determine the field for the 142nd running of the $2 million Longines Kentucky Oaks (GI), America’s premier race for 3-year-old fillies. Carina Mia earned 10 points for her win in the Golden Rod, which offered points to its first four finishes on a 10-4-2-1 scale. She also earned an automatic nomination to the Kentucky Oaks, which will be run at Churchill Downs on Friday, May 6, 2016. The 2-1 second choice in a field of nine, Carina Mia returned $6.20, $3.60 and $3.40. Mike Rutherford’s Stageplay, winner of Churchill Downs’ Rags to Riches Overnight Stakes and the 9-5 favorite under Ricardo Santana Jr., paid $2.80 and $2.40. Stoneway Farm’s Dream Dance closed late for third under Brian Hernandez Jr. to finish third and returned $4.40 to show. With the win Carina Mia’s record improved to 2-1-1 in three races and boosted her career earnings to $163,840. 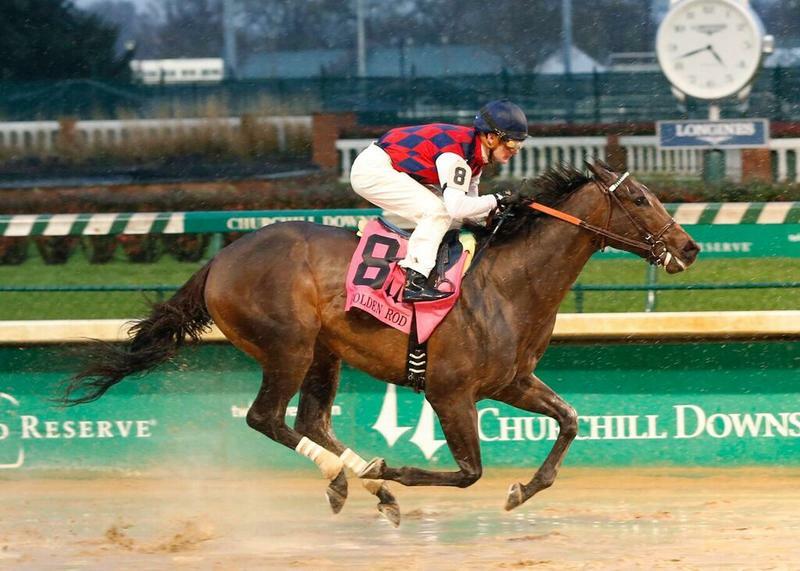 The winner covered the 1 1/16-mile distance over a sloppy track in 1:45.52 in her debut at a two-turn distance. She earned a second Golden Rod win for Mott, who saddled Darley Stud’s Gold Sunrise to win the 1995 Golden Rod. 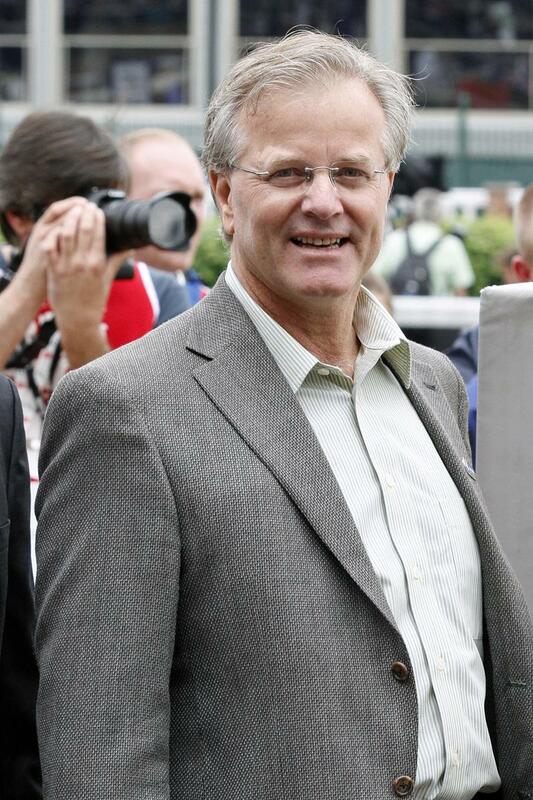 It was Mott’s record-extending 90th Churchill Downs stakes win. Carina Mia, who broke from post eight, cruised to the lead heading into the first turn in her first race at a two-turn distance. She maintained a comfortable advantage over Stageplay on the run down the backstretch through fractions of :24.38 for the quarter and a half-mile in :49.07. She was joined by Stageplay on the far turn as the team completed six furlongs in 1:14.13 and Santana sent Stageplay after the leader as the duo turned for home. The eventual runner-up got within a half-length of Carina Mia in mid-stretch, but Leparoux’s filly pulled away in the final furlong for a clear win. Dream Dance and Dothraki Queen, winner of Churchill Downs’ Pocahontas (GII) in September, rallied late but did not threaten the top pair. Super Cone finished fifth, and was followed by Cold Dish, Thump, Susie’s Yankee Girl and Charlotte Marie. The Golden Rod shared top billing on the “Stars of Tomorrow II” program with the 89th running of the $200,000 Kentucky Jockey Club Stakes (GII), which was run later on the program and won by Airoforce. KENNY McCARTHY, asst. trainer of CARINA MIA (winner): “You’d have to have confidence in her after her two starts over Keeneland. Obviously she’s a really nice filly so our only question mark today was how she would handle the distance and the two turns and I think that she handled it pretty emphatically there. 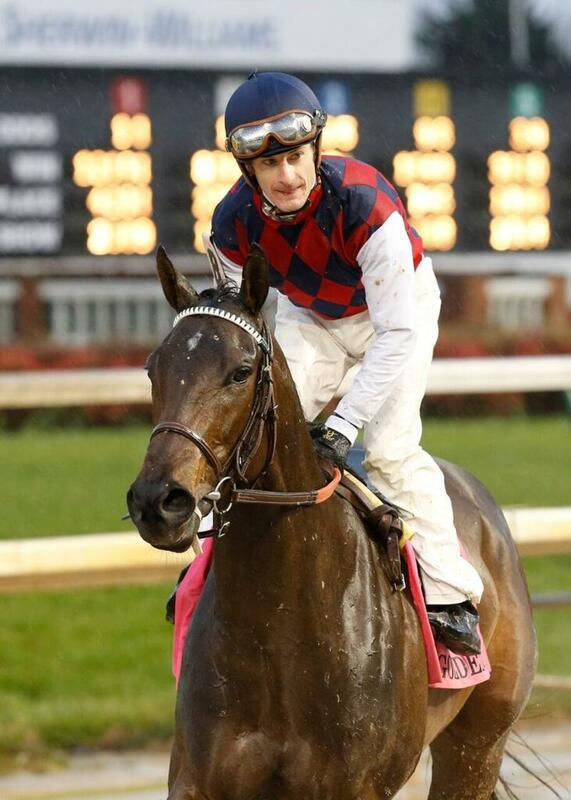 To view a pdf of the updated Road to the Kentucky Oaks Leaderboard, click here .